Jen, of Beantown Baker, made her strawberry cupcakes and filled them with mashed strawberries before frosting. I loved the idea of having the fruit inside the cupcakes and instead, I diced up strawberries to swirl them in the batter along with mashed strawberries. The batter turned a blushing pink hue but I added the food coloring Jen recommended to avoid the beige color that it takes on after baking. 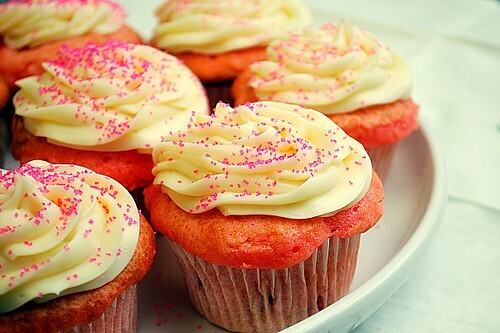 The crumb of these cupcakes were especially tender, thanks to the buttermilk used. To top these cuties, I used a standard cream cheese frosting which I piped using a star tip. To garnish, pink sprinkles did it for me, but if I had more strawberries, I would have used them instead. Nonetheless, these were fantastic! Preheat oven to 350 F. Line muffin pan with liners and set aside. Combine the buttermilk, mashed and diced strawberries and baking soda in a small bowl. Add the egg, egg yolk, vanilla, and melted butter; whisk to combine. In a larger bowl, combine the flour, sugar & salt with a whisk to lightly sift. Add the strawberry mixture to the dry ingredients and whisk until just blended. Fold in the food coloring. Using a scoop, fill each cupcake liner about 3/4 full with batter. Bake in the preheated oven for 15-17 minutes or until a toothpick inserted in the center comes out clean. Allow to cool completely before frosting. Frost cooled cupcakes using a piping bag fitted with a star tip and garnish with sprinkles.